A CES 2012 report from our our friends Engadget—>We’re live from CES 2012! 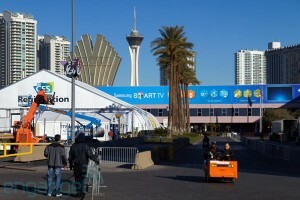 Here is a report from the big guys, Engadget with regards to CES 2012. We inspire to be like them, with a tech, and autism focus. We’ve landed in Vegas, just in time to enjoy the proverbial calm before the storm that will be the 2012 Consumer Electronics Show. Motorized carts zoom around the parking lot as the Las Vegas Convention Center begins to take shape — as always, getting the million-dollar-booths fully dressed before the curtain comes up next week seems an impossible task, but the crews will come through, making the finished product a far-cry from what we see today. And as exciting as it can be to roam the halls of the LVCC and surrounding venues during the show, the pageantry of CES is really about the products, including many of which we haven’t heard so much as a peep about in the weeks leading up to the show. But as the booths inside will remain veiled until company heads have a chance to brief attendees, a few hints have begun popping up outside the convention center, as workers hang sponsored banners above and along the massive entranceways. Some of these product hints serve to confirm previous rumors, so join us past the break for an early look at what’s to come. Be the first to comment on "A CES 2012 report from our our friends Engadget—>We’re live from CES 2012!"